Firebase Dragon Head: Are Tamils also not citizens of Sri Lanka? In the year 1998, Joubert Gnanamuttu an engineer by profession (a slightly built, soft spoken and self effacing gentleman who had lived for more than twenty nine years in Colombo and who spoke with a slight stammer), was travelling in the bus to Borella when it was stopped at an Army check-point at Stanley Wijesundera Mawatha. Asked to show his identity, he produced his national identity card and a driving licence as well as a student identity card issued to him by the Bandaranaike Centre for International Studies. Despite this proof of identification, he was asked to show a 'police registration form' to which request, Gnanamuttu replied that he did not have one and was not aware that the law required him to possess one. This sufficed for him to be rudely abused and detained while the rest of the passengers were allowed to proceed on their way. Gnamuttu was then taken to the Cinnamon Gardens police station where all his belongings, including his money, were taken from him and thence to the Bambalapitiya police station to be photographed. In a bizarre scenario thereafter, Gnanamuttu had been 'misplaced' by the police officer escorting the party of detainees, resulting in this mild mannered man having to, (since all his money and identification documents were at the Cinnamon Gardens Police Station), walk back by himself all the way from Bambalapitiya to the Cinnamon Gardens Police Station, whereupon he was greeted with consternation by the police officers and immediately detained. He was then produced before the Magistrate's Court, Hulftsdorp on a "B" Report which stated that he was suspected of "terrorist activities." A further shock then awaited him in the form of a lawyer who had informed Gnanamuttu that his identity card was in his possession and therefore that he had to appear for him for which fees would need to be paid. Gnanamuttu had refused stating that he had no money whereupon the lawyer had turned hostile. Gnanamuttu was then brought before the magistrate, allowed to sign a personal bond and asked to appear in court on a later date a week hence on which subsequent date, he was discharged. This Kafkan scenario was not conceived as a figment of my imagination but instead is an incident that was brought before the Supreme Court shortly thereafter, fully probed into and decided in favour of this unfortunate man who had undergone public humiliation and personal trauma, all due to the fact that he was Tamil, coupled with perhaps the fact that he stammered when he spoke. In 1999, the Supreme Court, examining this incident, declared a violation of the right to be free from unlawful arrest and detention declaring, in the judgment of Shiranee A. Bandaranayake J (with the then Chief Justice G.P.S. de Silva and Wijetunge J agreeing) that 'If the purpose at the security check-point was to ascertain the identity of the person travelling in that bus, these documents in my view, were more than sufficient." Eight years later, the impact of this judgment appears to have been minimal. Ironically, V.I.S. Rodrigo, the petitioner in whose favour the Court decided this week and who had undergone a similar harrowing experience, this time at the Polhengoda checkpoint and at the hands of a female sub-inspector, had also been arrested and detained because (in the words of the respondent police officer as disclosed to court) "he had stammered and appeared to be excited." One is constrained to question whether there is, therefore some highly confidential and secretive directive or departmental order nestling in the desks of the police stations that define stammering as a justifiable ground on which arrests may be made? Perhaps this is a moot question that the Inspector General of Police may be called upon by the public to answer. In this week's judgment, Chief Justice Sarath Nanda Silva (with Shiranee Tillekewardene and Balapatabendi JJ agreeing) passed severe strictures on the arrest and later detention of V.I.S. Rodrigo by the Officer in Charge of the Traffic Branch of the Kirulapona police station purportedly on the suspicion that his driving licence was forged. The Court referred to a 'vicious scheme' of the police as well as the 'abuse of power, rampant dishonesty and corruption and also misuse of the process of law that take place at 'check points' that have sprouted up." In the Gnanamuttu case, the Registrar of the Supreme Court was directed to send a copy of the judgment to the Inspector General of Police (IGP) for appropriate action but to all intents and purposes, nothing was done. In the judgment relating to the complaint brought by V.I.S. Rodrigo, the non-implementation of previous orders by Court, particularly regarding another recent instance where a person who was transporting furniture for personal use was wrongfully arrested, detained and tortured because he refused to give a bribe that was demanded, was specifically adverted to. It is in the context of this non -implementation that the Court, this week, issued directions in terms of Article 126(4) of the Constitution ordering the dismantling of permanent 'checkpoints' and proper regulation of the total prohibition of parking vehicles on principal roads. Further, IGP and Secretary, Defence was directed to ensure that minimum inconvenience be caused to the public as a result of movements of politicians on these roads. It is unfortunate that judicial intervention is required in order to drive home the thinking that while interests of national security may be paramount, ordinary citizens of any ethnicity cannot be harassed and threatened by law enforcement officers who besmirch the good name of the entire service in so doing. This rule applies not only to behaviour on the roads but also to all other procedures that are being put into place in the name of national security. What befell V.I.S. Rodrigo, (which is surely a plight common to many other roadusers), demonstrates that arbitrary police abuse is not limited to members of one particular ethnicity alone. But there is no doubt that it is citizens of this ethnicity who bear the very brunt of such attacks. The manner in which the mass arrests of Tamils took place early this week, ostensibly as a security measure is another instance of highhanded, insensitive and overtly discriminatory action. Each and every action of this nature only alienates the ordinary Tamil community, many of whom do not support the Liberation Tigers of Tamil Eelam. In many instances, none of these measures have a rational justification besides possessing racist undertones. 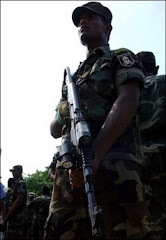 Why, for example, are civilians in Jaffna required to have a special identification card issued by the Army in which moreover, it is required to be stated as to what the political opinion of the applicant is? Where is the rational justification between this requirement and national security? Why should passengers, when traveling on the bus be separated by ethnicity and one lot of passengers detained without proper checking of their identification but solely because they are Tamil? Such occurrences make me ashamed to say that I am Sri Lankan and that I live in a country where such incidents are commonplace. These are issues that we should be putting to the Government of Sri Lanka sans any particular political persuasion and as citizens of Sri Lanka, not as Sinhalese, Tamils, Muslims and others. Labels: Are Tamils also not citizens of Sri Lanka?